My husband and I own a minifarm, named Downstream Farm Organic Produce. 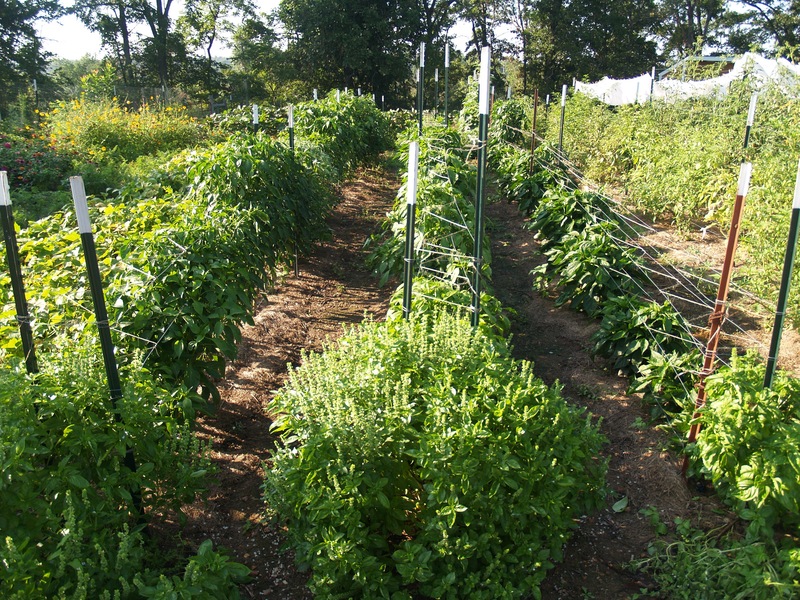 We provide tomatillos and soon burgundy okra to Ozark Natural Foods and a local restaurant. But our main goal is to grow as much of our own food as we can. This year we are growing for ourselves onions, garlic, leeks, carrots, potatoes, collards, chard, cucumber, beets, sweet potatoes, tomatoes, sweet peppers, hot peppers, dried beans, blueberries, apples, and numerous herbs and flowers. We also raise our own chickens for eggs and meat, and my husband hunts and fishes. With a few of the foods we raise like onions, carrots, potatoes, and beans, some people might argue that these aren’t worth the effort to grow because it doesn’t cost much to buy them in the store. But growing our own food isn’t just about saving money. We know where our food came from and how it was grown. Overall, our efforts leave us with a sense of pride when we can look at our well-filled freezers and pantry at the end of the season. Of course, very few people have the space and time to produce as much of their food as we do, but most of us can make small steps. Consider a small garden plot in your yard. I used to have a very shady yard, but I still managed to have herbs and strawberries, and leafy green veggies. A friend living in an apartment filled a small kid’s swimming pool with soil to grow some veggies. If you don’t even have a balcony, culinary herbs like parsley and thyme will grow well in a sunny window. Sprouting is another option for nearly any home as you don’t even need a sunny spot to grow a jar of sprouts any time of the year. Have alfalfa sprouts in just a few days following these simple directions (http://www.simplebites.net/how-to-grow-sprouts-at-home/). And you can experiment with many different sproutable seeds and blends that include: fenugreek, broccoli, radish, daikon, clover, lentils, and mung and other beans. For flavor, nutrition, and satisfation, growing your own foods can’t be beat. It is not too late to get started on growing something for a fall harvest. This entry was posted in Health and tagged alfalfa sprouts, food, health, local, nutrition, sprouting. Bookmark the permalink. Glad you enjoyed this post. I think freezing preserves nutrients better so we freeze okra, hot peppers, sweet pepper, tomatoes, purple hull peas, greens, basil, cilantro, etc. I broil the sweet peppers until they are slightly roasted before I freeze them. I can tomatoes and New Mexican green chiles and pickle okra, tomatillos, hot peppers, cucumbers. Of course, I make salsa too. I either can it or freeze it. I often can it because I run out run in my freezer. Thank you! I would love to hear some of your ideas, too.